The Philippines and US Navy are conducting joint patrols in the South China Sea, US officials announce. The US rarely conducts joint patrols with its partners in the region. Defense Secretary Ash Carter said the US would also increase rotations of its forces and military support in the Philippines. Tensions have escalated in the South China Sea in recent years, with China steadily expanding its military presence in the region. 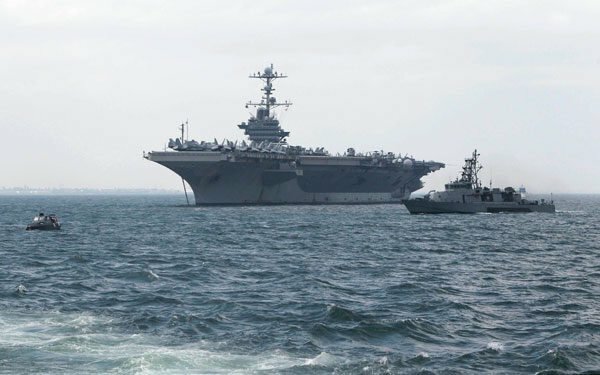 The joint naval patrols, which began last month, “contribute to the safety and security of the region’s waters,” Ash Carter told reporters after a meeting with Philippines President Benigno Aquino. US troops and combat aircraft are currently participating in joint combat exercises with Philippines forces. The announcement comes just days after a Philippine diplomat asked the US to help persuade China not to build on a South China Sea shoal important to Filipino fishermen. The US has expanded its support for allies in the South Pacific in recent months, following China’s military build up – which includes construction of islands with airstrips. China, which claims a wide swathe of the sea, has been reclaiming land around reefs. The US and other countries have called for the halt of such activities, accusing it of militarization, but China has insisted that the construction is for civilian purposes. Last week, US military officials announced they would send $40 million in military assistance to the Philippines to increase intelligence sharing, surveillance and naval patrols. How Can Your Business Free Up Money?